Kerala based biker was to participate in the "India Baja" off-road rally which was to be flagged off on Saturday. The biker apparently lost his way while exploring the surroundings of Jaisalmer, say officials. 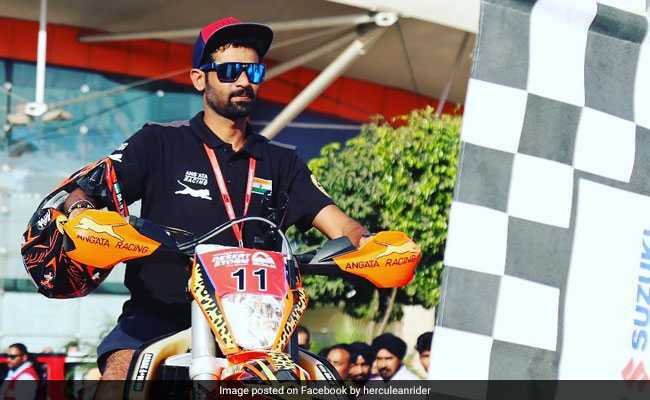 A biker, part of a motorcycle adventure rally, was found dead in Rajasthan after he apparently lost his way while exploring the surroundings of Jaisalmer, officials said on Saturday. Asbak Mon, 34, originally from Kerala, was keen to participate in the "India Baja" off-road rally which was to be flagged off on Saturday. On Friday morning, he was found dead. His bike was lying on ground beside him at Shahgarh Bulj area, around 200 km from Jaisalmer, and his water bottle was empty. The post-mortem examination report stated that the biker had died of dehydration, said Superintendent of Police Jagdish Chandra Sharma. His body was handed over to his wife and father-in-law. Speaking to IANS, the police officer said Asbak Mon had travelled all the way from Bengaluru to participate in the two-day adventure event. He hailed from Kerala's Kannur district but was residing in Bengaluru where he was working with a private firm. He went out on his own to explore the city and surroundings on Thursday. In fact, he was yet to register with the race. "When he did not return, we collaborated with police and sent our parties to search for him," said one of the organisers of the race, on the condition of anonymity. Prime facie, it seems that Asbak Mon had lost his way while the other members who also visited the locale returned. It seems he was exhausted with water he had and hence feeling dehydrated, he had fallen from his bike and later did not wake up as there was no water left in his body, the police officer said. A case of doubtful death has been registered in this context and investigations have started after the post-mortem report came. "We shall inquire the organisers, his colleagues and teams as our next point of action," said Mr Sharma.